This new reissue has a lot going for it, bizarre cover art notwithstanding. The performances of both works are very fine, and the coupling of Dvoř�k's best concerto with his best-loved symphony is apt. Both works date from the period the composer spent in New York as director of the National Conservatory of Music. While some, as Raymond Tuttle points out in his biographical booklet notes, have found American influences in the music, both pieces are quintessentially Czech. Heinrich Schiff proves a sensitive and generous soloist in the concerto. He is a fabulous cellist, with technique to burn and a golden tone. He delivers a virtuoso performance here, but an understated one. Unlike Rostropovich, Piatigorsky or Du Pr� in their various compelling accounts, he does not impose himself on the music. Instead he engages in dialogue with the orchestra, allowing his instrument to sing soulfully in the slow movement and the gorgeous coda, but giving the orchestra space to shine. The duet between solo cello and solo violin about half way through the finale is a prime example of his sympathetic approach. 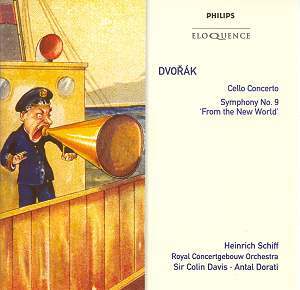 Sir Colin Davis has made some of his finest recordings with this orchestra - including his recording of the last three of Dvoř�k's symphonies (Philips Duo 456 327-2 ) - and the rapport between podium and pew here is affectionate. His rubato is generous and he suffuses the score with warmth. This is not the most commanding or penetrating performance you will hear, but it is a lovely reading, caught in warm analogue sound. The symphony was recorded some 21 years earlier than the concerto, but apart from a little crowding at the climaxes, the sound is almost as good. Dorati turns in a performance of pace and power. The brass bray, full-throated, in the first and last movements, and attacks are crisp. He is free with his tempi in the flowing second movement, and his scherzo breathes fire. The orchestra gives him everything he asks for. Again, this is not the most well-rounded, detailed performance of this much-loved symphony. My prime recommendation in this price bracket is Harnoncourt (see review). For sheer animal excitement, though, Dorati is hard to beat. In both of these performances, the Royal Concertgebouw Orchestra is wonderful. This must be one of the two or three best Dvoř�k orchestras in the world � next to the Czech Philharmonic. I say this because Dvoř�k's scores benefit from a particular type of orchestral sound. Warm string tone, characterful woodwinds, and athletic rather than muscular brass are the keys, at least in my mind, and the Royal Concertgebouw Orchestra has all of these. The winds in particular are amazing. Just listen to the delicious, luxurious cavalcade of woodwind solos before the cello's first entry in the first movement of the concerto, in dialogue with the cello in the concerto�s finale, or the haunting cor anglais solo in the famous largo of the symphony, and you will see what I mean. This disc deserves your consideration.